The Legend RT from Thermo Scientific is a large capacity benchtop refrigerated centrifuge equipped with SMART spin auto imbalance detection. The Sorvall RT Legend combines speed and capacity with a large selection of rotors and a maximum capacity of three liters. This tabletop centrifuge is easy to maintain with its brushless motor and user friendly with its analog controls. Each of the Thermo Sorvall Legend RT centrifuges are comparable to the Eppendorf 5810R, Beckman Allegra X-15R, Eppendorf 5804R and Beckman Allegra X-12R. Rotor system is built to handle conical tubes, flasks, falcon tubes, micro-tubes, blood collection tubes, bottles and microplates. The Legend RT benchtop centrifuge tops out at a speed of 15,000 RPM when using a fixed angle rotor. However, when running a swing rotor, the centrifuge achieves a top speed of 3750 RPM. The Sorvall Legend RT is setup for 120 volt (60Hz) power, comes with four user programs, and has a temperature range of -9°C to 40°C. The Sorvall Legend RT come from a long line of trusted refrigerated centrifuges used in a wide range of lab studies. Contact us today with questions about any of the used benchtop refrigerated centrifuges on our site. 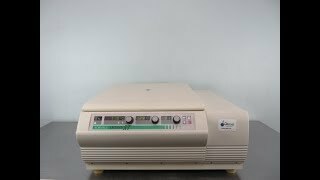 This listing is for a lightly used Thermo Scientific Legend RT Centrifuge. The benchtop centrifuge has been tested multiple times to ensure instrument is performing to factory specification. Please let us know if you'd prefer the Microplate Carrier or the Conical Tissue Culture Bucket Rotor Package. All of our lab equipment comes backed with our standard warranty.